We were especially excited about our May 2015 foray to Tennessee because we had received advanced notice that some especially important things were transpiring in the Volunteer State as far as alternative housing is concerned – and that was music to our ears. 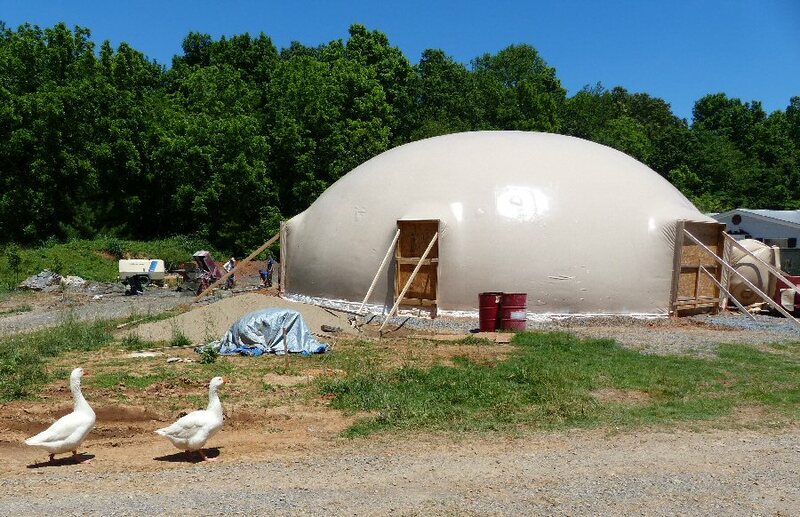 These ducks were attracted to the egg-like domes under construction in White House, TN. On the first full day of our trip we ventured up to White House to take in a bucket-list moment for Team MusicCityNashville.net. We were finally going to fulfill a dream and see a steel-reinforced concrete Monolithic Dome in the making. We had been inside a completed M.D. before but seeing one under construction was a whole different ball-game. This double-dome complex under way is the ten year vision of one couple now nearing completion. 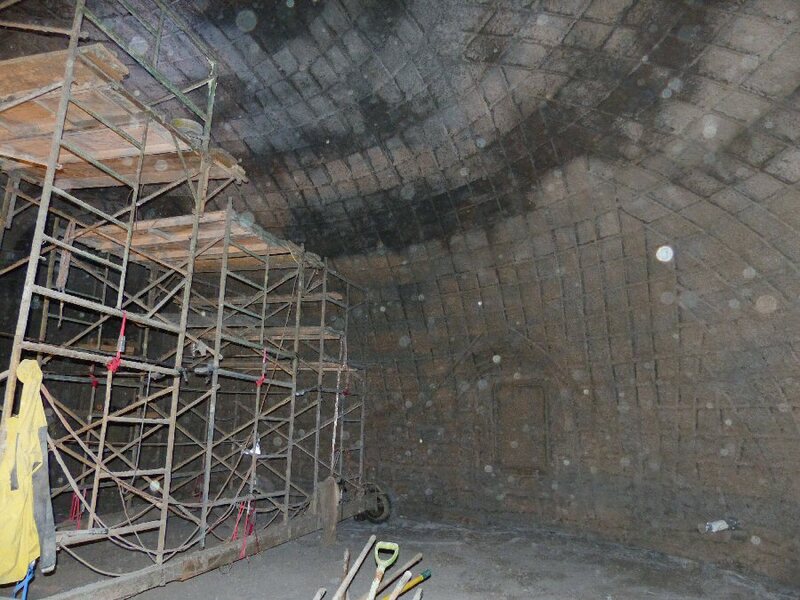 They told us that they are pursuing the concrete dome for the dual purpose of aesthetics and safety and they had a pair of one 50-foot and one 35-foot diameter domes that were in the final stages of receiving their shot-crete interior. A Monolithic Dome takes shape with shot-crete and rebar. Helping this family along the way was Nashville resident Paul Freeman who is a self-styled “dream facilitator” and a very active consultant on the alternative housing front in Middle Tennessee. We didn’t get a chance to ask Paul where his interest in out of the box domestic design came from but we didn’t have to look too far. Surely, every man wants to be the king of his regal residence, and as they say, a man’s home is his castle. However, Paul’s uncle Mike Freeman took that concept a little farther than most. 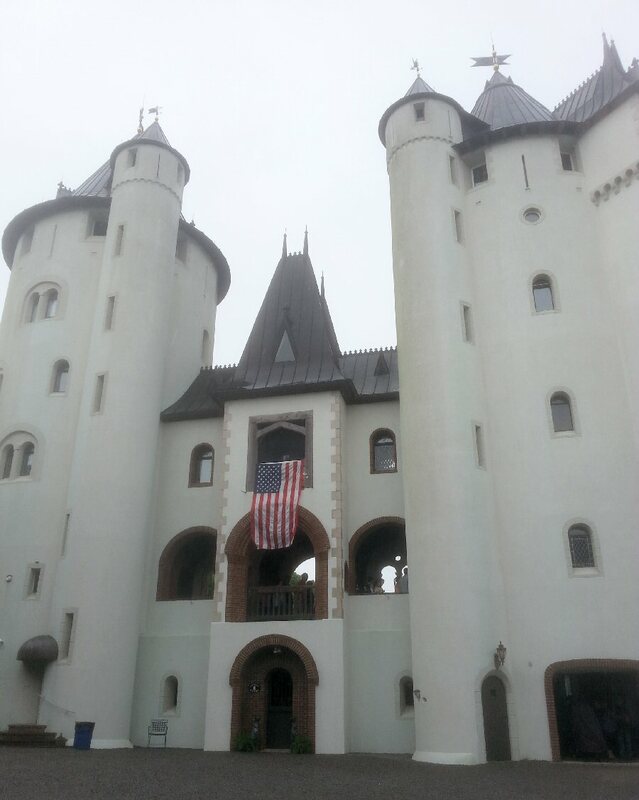 Castle Gwynn was built to be the centerpiece of the Tennessee Renaissance Festival and it has stood tall as a proud landmark now for 30 years. This festival gives the public a chance – once annually – to tour the castle and it has inspired many of the state’s great residents. A young Taylor Swift was so taken by the structure that she was moved to shoot the video for her blockbuster “Love Story” here. Castle Gwynn looms over the landscape just north of Franklin, TN. So, maybe that’s where a young Paul Freeman first got his inspiration to pursue alternative housing. But, he’s not content to rest on what he’s achieved so far. His desire is to take the concept of sustainable living further, farther and wider. And, his latest project is sure to help with that goal. Further Farms in Nashville has recently broken ground on their new warehouse, kitchen and storefront. They chose a Monolithic Dome base with a triad of additional extensions for a sturdy, energy efficient, environmentally friendly structure that promotes an open environment and shared space. Mr. Freeman is serving in the capacity of consultant on this project that brings a high-profile vision of the future just minutes from Music City. Further Farms is a down-to-earth Grateful Dead themed farmer’s market specializing in sauces and spices grown locally offering unique blends for every meal. While in Tennessee, we were introduced to another down-to-earth alternative housing facilitator who specializes in the creation of Earthships. Marcus Sisk is a graduate of the Earthship Biotecture Academy in Taos, New Mexico and he’s currently finishing up construction of an Earthship on his property in Gallatin, TN. An Earthship is a type of passive solar house that is made of both natural and recycled materials (such as earth-filled tires). They are intended to be “off-the-grid ready” homes, with minimal reliance on both public utilities and fossil fuels. Mr. Sisk is an Earthship consultant and the founder of BiotectureTN.com. 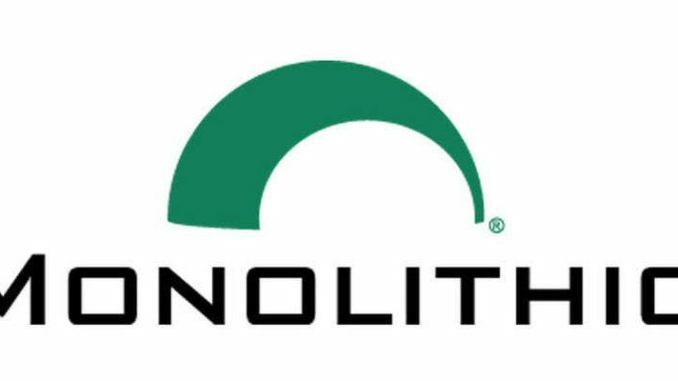 His next goal is to construct a fully permitted global model Earthship in the city of Nashville. When it comes to being at the forefront of advancing the cause of alternative housing and promoting a “consciousness revolution” it’s clear that many of the good citizens of the state of Tennessee have volunteered to take the lead. Now, it should be just a matter of time before more dreamers start heading south to build their own Dixie Dream Domes and Earthships – and, we’ll be right there with them to report on their progress!